My first encounter with the crop circle phenomenon began in late summer 1996. At the time I was living on the north coast of Devon, a half-day’s journey to the heart of crop circle territory in Wiltshire. I was an avid investigator of the esoteric and unexplained, delving into the paranormal and occult worlds, UFOs and extraterrestrial intelligence, the secret origin of the human species and other contemplative subjects such as ecology and spirituality. I was absorbed by the inter-relatedness of these subjects as well as what was known and systematically covered-up or manipulated by the military, government agencies and the media. While I was immersed in all this, trying to distinguish between the information and disinformation, I got a glimpse of a big event happening in Wiltshire that I had been ignoring. 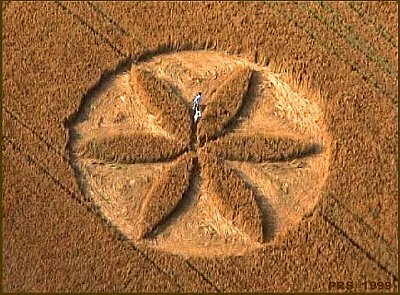 The reason 1 hadn’t paid serious attention to the unfolding crop circle story was because I had naively accepted the “circle hoax” theory. Then in the winter of 1996,1 happened across an obscure UFO magazine with a feature article on crop circles from the previous summer. My jaw dropped and a tingle shot up my spine! WOW! This was a major wake-up call. I had seen pictures of simple circles and the odd pictogram, but these new images were staggering. They struck me as having the foremost importance. Why were they not on the headline news? I was an avid reader, why had I seen so little about them in the media? I found myself staring in near disbelief at the three major formations from that year: the Stonehenge and Windmill Hill spirals and the Alton Barnes double helix or DNA formation. Amazing! The notion that people had made these massive and geometrically sophisticated designs seemed absurd. This was something much more than a hoax or prank. But to be certain, I would need to investigate them first-hand. I made the decision in that moment to visit the crop circles at the earliest opportunity, but I would have to wait through the winter. In those bleak months I read everything I could lay my hands on relating to the subject. 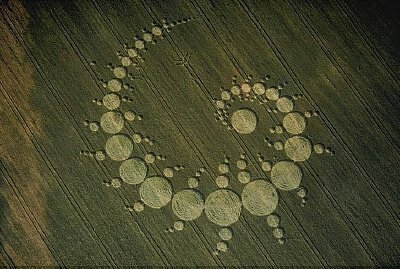 I was pretty sure by now that the crop circle phenomenon was one of the most important, if not the most important event on the planet and hardly anybody was paying attention to it. My first foray into Wiltshire, the most prolific area for the circles to manifest, was early July 1997. After several tedious hours on the bus I arrived at a small Wiltshire market town, my rucksack stuffed with tent, sleeping bag and as much food as I could carry. My plan was to stake out a hill in an area of regular circle activity and await the appearance of a glyph. After hours and hours of walking and searching for the right spot, I arrived at my final destination, the Vale of Pewsey. The area looked and felt utterly magical, a place where almost anything was possible. Sitting up on those hills, overlooking the expansive crop fields, I sensed a still intensity in the atmosphere. The Vale held something enigmatic and deeply penetrating. Nothing too far out of the ordinary happened in the first couple days. I took in the amazing scenery and had some magical, enchanted moments but no crop circles. I had expected to see them everywhere in every field and felt rather disappointed that this was not the case. I actually began to wonder if all those images from the cereal fields were nothing more than an elaborate computer- generated hoax. Surely not!? On the third day of my first week’s outing, as I was wandering around a souvenir shop in the tourist Mecca of Avebury, I overheard a man addressing the shop manager. The words, “new crop circle”, immediately grabbed my attention. After pushing my way through a dense crowd of tourists I arrived at the counter and practically demanded to know all about the new circle. Where is it? How far is that? Can you give me a ride? OK, then, I’ll walk! Thus, I set out to cover the six or seven miles to the new arrival at Alton Barnes, which I did in less than two hours! I was full of renewed enthusiasm and had at last a specific destination. People were already milling around the formation when I arrived. I walked straight into the huge and elaborate pattern and within minutes of entering I was convinced that humans could not have made it. The crop was not flat to the floor, as one would expect if it had been put down with planks of wood or garden rollers. Instead it looked as if some sort of fluid had whipped and washed around the area very swiftly to create the formation as it flowed. Everything I saw left me with the impression that a single agency had been at work in this field the previous night, rather than any group or team effort. I was hooked and hungry for more. Throughout the remainder of that summer I spent many weeks in the circles and on the land, often having bizarre experiences with the formations or people I met. It was almost as though I was being guided. The following summer (1998) I did much the same, spending as much time as possible in Wiltshire, sleeping on the hills, interacting with the land and the circles and indeed many people who were similarly involved in the circle phenomenon. By late summer that year I was well acquainted with outdoor life and loved every minute of it. A major turning point in my life occurred one sunny afternoon that summer. As 1 was relaxing on Adams Grave, a Neolithic hilltop burial site near Alton Barnes while marveling at a giant formation in the valley below, a trio of women entered the scene. One of these women, Frances, was later to become my wife and partner in crop circle research. I moved to Devizes, the small market town where I first landed to begin my crop circle pilgrimage and where I now work for a local charity as I continue to research and report on the ever-evolving crop circle story. With the passage of time intriguing new elements began to enter the picture. One such occurred in 24 July 1999 when a crop circle appeared in the wheat opposite the mysterious Silbury Hill. As on previous occasions, my wife Frances and I decided to spend the night in this latest arrival, in the hope of experiencing some residual effects. We were not to be disappointed! Shortly before dusk (approximately 9:30pm) we set off from our home and drove the ten miles to the circle location. We parked in the Silbury Hill car park, crossed the road and made our way up the hill dragging all our equipment along with us including cameras, binoculars, sleeping bags, rain covers and even our dog, Vesta. A few minutes later we came upon the formation, which –– like a huge starfish –– was spread out over the top of the hill. It must have been at least two hundred and fifty feet in diameter, very impressive. As we stepped into the formation, daylight was starting to fade so we wasted no time in selecting a spot to sit out the forthcoming night. We opted for the very centre of the glyph, largely for practical reasons. From this spot we had a clear view of the surrounding landscape. After a few moments getting ourselves comfortable we sat quietly with Vesta, taking in the view and marvelling at an evocative sunset. No more than ten minutes had gone by when we both spotted what appeared to be a luminous sphere of light hanging in midair close to a copse of trees, some half mile from our position across the valley. No sooner had we seen this orb of orange-ish light than it blinked out. We looked at each other in mild amazement. What the hell was that? Just a few moments later it reappeared in the same spot as before. The fact that this was happening in the twilight caused us both excitement. In our experience, such obvious daylight or dusk sightings are rather rare. We had a clear, direct view of the activity. It was quickly apparent that we were observing something very strange indeed. We both sat and watched this single light hang there for some thirty minutes. As the ambient light faded and darkness set in, the sphere grew in brightness and was perceivable as soccer ball size. Nothing happened with this light for the next hour or so when suddenly a second one appeared next to the original. This new arrival was smaller and a little less bright but was nevertheless still obvious from our viewing position. We went on to watch these two objects for what seemed ages. It was, in fact, a couple hours. I could hardly believe that not a single car travelling on the fairly busy A4 road, which runs between Silbury Hill and the circle site, stopped for a better look at these objects hanging low in the sky just to the left of the road. Strangely, no one seemed to notice a thing. A short time later the second, less bright light vanished as quickly as it had appeared. All the time this was going on I was attempting to take still photographs of the lights, but I was having problems with the camera. As soon as I switched the power on it would go off immediately or the zoom lens would go in and out of its own accord. All attempts to photograph the lights failed, or so I thought. As it turned out, when I had my film developed one frame had the larger of the two lights perfectly captured (pictured above). Although none of the travellers along the A4 seemed to notice the weird lights in the sky, others did. Military helicopters arrived at very high speed a few hours into the sighting. From our rear and heading straight for the one remaining light came a pair of heavy, extremely noisy choppers. Soon after flying directly over our heads at approximately one hundred and fifty feet, the helicopters arrived in the general area of the activity. 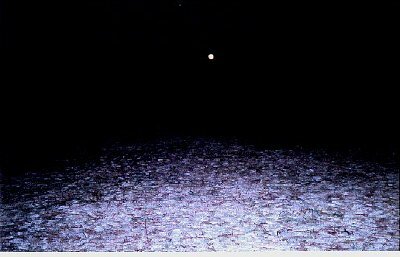 But just as they got close however, the light blinked out and suddenly reappeared approximately five miles away over dense woods near the village of Lockeridge. The light, still just as bright, remained in this second location for the entire time the helicopters were in its original position (about five minutes in all). These choppers had arrived, it seemed, with a clear intent and appeared quite confused when they lost the target. For some reason the helicopters did not appear to see the light over the woods at all. They then left the area as fast as they had arrived. As they did so the bright orange-ish light reappeared in its original position. After this no more helicopters came close and the light remained in place for several hours, periodically moving in subtle arching motions as before. We eventually went off to sleep and awoke around 4:30 am. We searched the area of activity from the previous night in the hope of finding a fresh new formation. It was not to be found; no formations arrived in that general direction that night. However, the following night, right where we both had observed the light phenomenon for hours and hours, a small “flower of life” formation did indeed show up (pictured below).